Urea is one of the key substances in urine and is a major waste product in the body. This means it must be removed since it is toxic to us. Urea is formed from the deamination of excess proteins, where the amine group is removed in the liver (to form ammonia). This then reacts with carbon dioxide to make urea. The reaction is as follows. If you have a look at the kidney nephron the first part of it is called the Bowman's capsule where substances are forced out in ultrafiltration because of increased pressure from the arteriole size decreasing. Only smaller molecules like urea, minerals, water an glucose are lost, larger proteins remain. The Bowman's capsule leads on to the part of the nephron called the proximal convoluted tubule (PCT). This is where the useful molecules from the ultrafiltrate are reabsorbed; particularly glucose; the diagram below shows this. Along the surface are epithelial cells. These are responsible for moving all glucose and amino acids, the majority of water and even half the urea (only because the kidney has no way of stopping) to the tissue fluid where they diffolve into the blood. They have many adaptation to help with this. 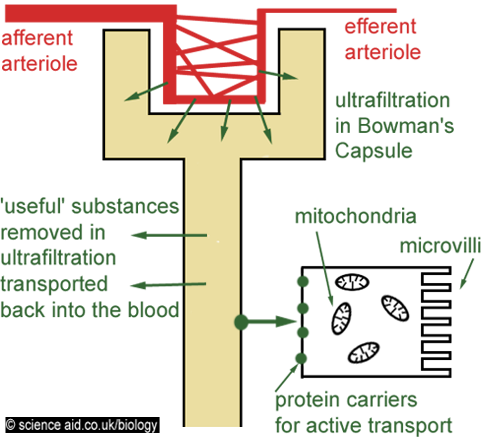 There are many protein carriers that actively transport substances, and in order to help with this, there are many mitochondria that provide the ATP for this. A further adaptation is the microvilli in the surface of the cell, this increases the surface area, so that more substance can enter. The loop of Henle is a bend at the bottom of a nephron that follows the PCT (please note that it is not as rectangular as the diagram suggests). Here, lots of changes in concentration and osmosis remove water from the filtrate. Have a look at the diagram below. Our process starts in the ascending limb where active transport removes sodium ions. Normally this would alter the water potential so that water follows; however, the ascending limb is impermeable to water so it remains. Now, because of the active transport the interstitial region (between the two limbs) is concentrated. This means that water will leave the descending limb (this is very permeable to water) by osmosis. So if we look at what happens overall: water leaves coming down the loop, becoming more concentrated as it does so, until the water potential in the tubule is the same as the interstitial region; so that it is most concentrated at the base of the loop. As the filtrate moves up the loop, salt is removed by active transport, which means it becomes less concentrated! So overall there is a net loss of water. Following on from the loop of Henle is a part of the nephron called, the distal convoluted tubule, here substances are transported from the blood into the nephron for other types of homeostasis and this is controlled by hormones. Also, the water content of the blood is contolled here by the hormone ADH (Anti Diuretic Hormone) secreted by the pituitary gland. The table below outlines how this is done.